Garmat spray booths offer the most effective airflow in the market. Engineered with production enhancing features that help increase your throughput while decreasing your operating costs. High efficiency throughout, whether it be incorporated in the actual operation of the spray booth or simplifying maintenance to ensure continued optimal performance. 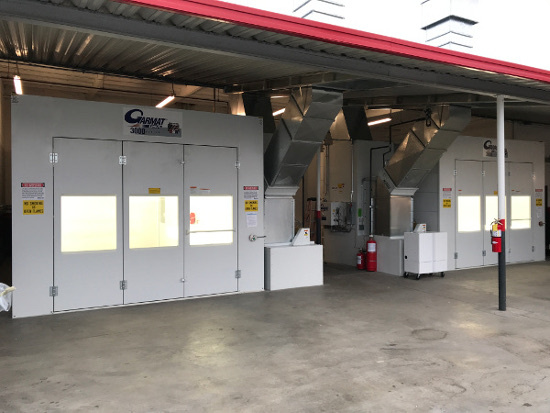 The 3000 Series is Garmat USA’s top of the line downdraft spray booth. It has superior airflow and the most effective lighting in any booth available in the market today. Rely On takes great pride in providing auto body shops with innovative equipment such as the 3000 Series. The 3000 Series features downdraft airflow: clean air is forced in through the ceiling intake plenum and exhausted out of a pit located in the flooring. The supply and exhaust filter is designed for the high-pressure velocity of the area of the booth providing consistent air flow required for a quality paint job. In turn, positive pressure within the paint booth prevents contamination from entering the booth. As a result, cleaner air translates into higher quality paint jobs. Let Rely On Technologies and Garmat USA take your shop into the future of automotive re-finishing!